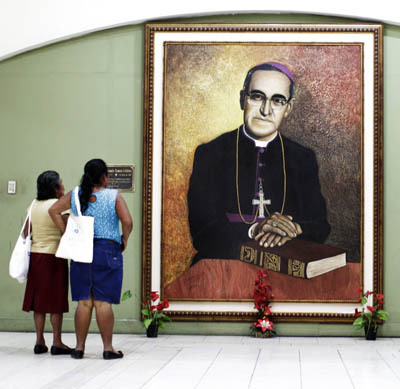 VATICAN CITY (CNS) — Salvadoran Archbishop Oscar Romero will be beatified in San Salvador “certainly within the year and not later, but possibly within a few months,” said Archbishop Vincenzo Paglia, the postulator or chief promoter of the archbishop’s sainthood cause. To the accusations that he supported liberation theology, Archbishop Paglia said, Archbishop Romero responded, “Yes, certainly. But there are two theologies of liberation: one sees liberation only as material liberation; the other is that of Paul VI. I’m with Paul VI” in seeking the material and spiritual liberation of all people, including from the sins of injustice and oppression. All of the complaints, Archbishop Paglia said, slowed the sainthood process and “strengthened his enemies,” who, he said, included the late Colombian Cardinal Alfonso Lopez Trujillo, who believed the Salvadoran archbishop tended toward Marxism and thought his canonization would be seen as a canonization of the materialistic, political form of liberation theology criticized by the church. “This mountain of paper, unfortunately, weighed down” the cause, the archbishop said. But the Congregation for the Doctrine of the Faith examined all his homilies and writings and cleared them. Promoters of the cause, he said, collected “a mountain of testimony just as big” to counter the accusations and to prove that Archbishop Romero heroically lived the Christian faith and was killed out of hatred for his words and actions as a Catholic pastor. In the end, Archbishop Paglia said, both a panel of theologians working for the Congregation for Saints’ Causes and the cardinals who are members of the congregation voted unanimously to recommend Pope Francis recognize Archbishop Romero as a martyr. Msgr. Jesus Delgado Avecedo, Archbishop Romero’s secretary and aide, said he met the archbishop the day he was installed in San Salvador; he came to the archdiocese with a reputation as being conservative. “The clergy did not like him at all, because the clergy of San Salvador were educated in the teachings of the Second Vatican Council and Medellin,” the 1968 meeting of the Latin American bishops that called church workers to stand with the poor and for urgent and radical democratic and economic reforms throughout the continent. But the use of that phrase by Salvadorans during political demonstrations, as well as the printing of T-shirts with both the faces of Archbishop Romero and Che Guevara, the Cuban revolutionary, did not help make the case that the archbishop’s murder was because of his faith, not his politics, he said. Archbishop Paglia said that in December 2012 during his first and only private audience with Pope Benedict, the pope informed him that he had decided to “unblock” the cause and allow it to move forward. “The martyrdom of Romero has given meaning and strength to many Salvadoran families who lost relatives and friends during the civil war,” Archbishop Paglia said, and the church in El Salvador is beginning to collect information and testimony about their faith with the idea of proposing more saints’ causes.